From the very beginning, Virgin Voyages vowed that they would be unlike any other cruise line sailing the seven seas. So far, they’re living up to that promise. The line has just announced that they will not be including an all-you-can-eat buffet or main dining room on their first ship, Scarlet Lady. 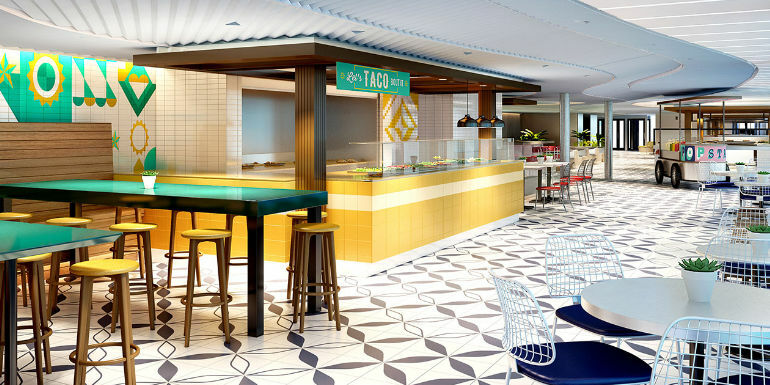 There will be 20 different dining options onboard, all included in the cost of the cruise, and each one will be placed right near a bar. On top of a few included dining venues, most mainstream lines also offer extra-charge “specialty” restaurants. Virgin decided to go against the grain in that area, much like luxury lines do on their small vessels. “On a Virgin Voyage, it doesn’t make sense to be nickel and dimed or pay more for better food,” Chief Commercial Officer Nirmal Saverimuttu said at an event Wednesday night in New York City. 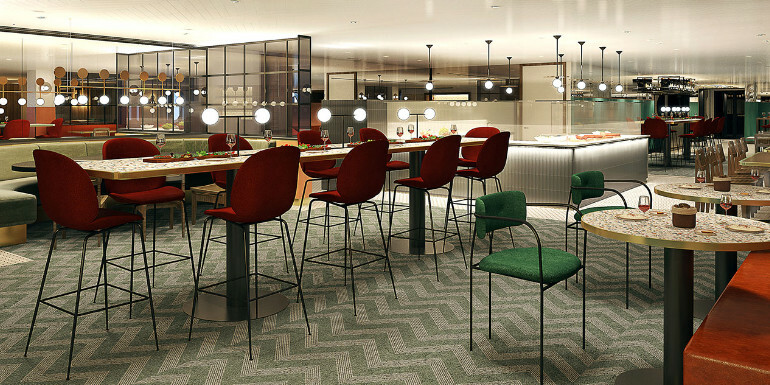 Wake - Situated in a 5,866 square foot space at the aft with views of the ship’s wake, the venue will serve a “theatrical take” on steak and seafood in an experience inspired by The Wolseley - London and The Grill - New York. 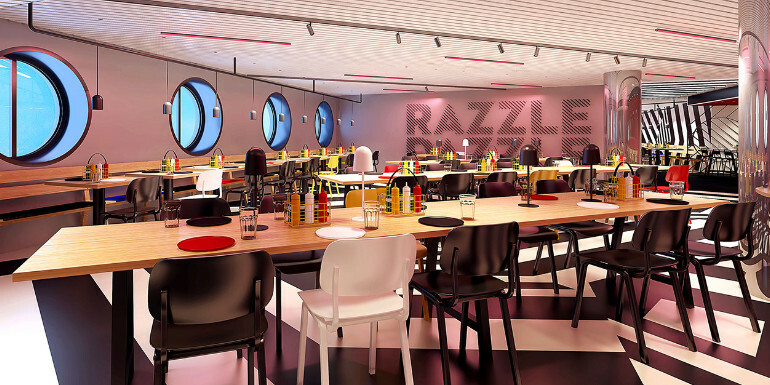 Razzle Dazzle - The interior design of this restaurant nods to its namesake, using patterns of black and white reminiscent of the camouflaging of ships from World War One. Vegetarian and vegan food will be served there, along with fresh juice from the in-house juice bar. The Test Kitchen - Offering “avant-garde cuisine,” the laboratory-like eatery is part restaurant and part cooking school. Chef-driven set menus are presented in the form of an ingredient list to travelers, who discover how the chef combines the list of flavors throughout the meal. Geonbae - The line touts this Korean barbecue restaurant as being “hosted by the loudest servers at sea.” Each meal begins with a complimentary round of soju for the table with passengers encouraged to take part in rambunctious Korean drinking games. Pink Agave - A Mexican restaurant designed to be a shared plate experience, where the DJ amps up the energy as the evening turns to night. Extra Virgin - A trattoria serving Italian food featuring handmade pasta made fresh daily. Dock - A beach club-inspired space serving up Mediterranean small plates, salads, dips, and mezzes. How do you feel about Virgin getting rid of the traditional buffet? Do you plan on sailing aboard the Scarlet Lady?